Conscientious Harvesting: Usnea is a lichen that is slow growing and therefore, should not be harvested from living trees. It is best to harvest what is available from branches blown down from a storm or those that have fallen to the ground. Pollution Sensitivity: It is important to know that this plant, while growing, is sensitive to absorbing sulfur dioxide air pollution, especially sulfur dioxide, a by-product from combustion of petroleum and coal. The Usnea harvested for this tincture is from a pristine area at an altitude of 5,000 feet, isolated from sulfur dioxide pollution. Usnic acid, the main constituent of Usnea, has been extensively studied as an antibiotic that inhibits 16 known gram-positive bacteria (both the resistant and non-resistant strains) such as streptococcus, staphylococcus, and mycobacteria. Usnea is used for acute and chronic lung infections, such as pneumonia, colds and flu, and as an adjunct to tuberculosis (TB) treatment.. It can also be used as an antibiotic alternative for people who do not respond to the popular herb Echinacea. Usnea appears to kill bacteria by disrupting their metabolic function, cutting off energy supply to the cells. Unlike bacterial cells, human cells are less permeable to usnic acid and are not adversely affected. Adult Dosage : 1 tsp. of tincture in warm water 30 minutes before mealtime (three x day) up to 10 days. Usnea is active against a number of viruses that present sores and lesions including herpes simplex, polyomavirus (a tumor virus), Junin virus, Tacaribe virus, and Epstein-Barr. It may be used as a wash for the treatment of Impetigo (staph or strep infections of the skin). Usnea has also shown to be effective as an antifungal against Candida albicans. In vitro research strongly supports Usnea's antimicrobial properties. For Herpes Simplex, take 1 tsp. of tincture in warm water, 30 minutes before mealtime (three x a day) up to 10 days. Then re-evaluate need for further treatment. For Candida albicans, prepare a douche with ½ ounce tincture to 1 pint water and mix well. Douche 2 times a day, upon rising and before retiring, for 3 days. For Impetigo (staph or strep infections of the skin), use as a skin wash mixing 1 part water and 1 part tincture. Apply directly on the site of the infection using a cotton ball or cloth twice a day, morning and evening. Adult Dosage : Use as a gargle and mouthwash by mixing 25 drops with ½ c. warm water. Usnea has been reported to be active against a number of parasitical disease organisms as well as used as an antiproliferant for a number of cancer cell lines. Usnea has shown anecdotal usefulness in the treatment of difficult to treat fish infections in aquariums and ponds. Usnea barbata has been used in cosmetic production for its antimicrobial and antifungal properties as a preservative and deodorant. Do not use internally during pregnancy. Used topically, Usnea may cause contact dermatitis in some people. The sodium usniate (usnic acid) that Usnea contains might cause liver damage if taken over periods of 2 weeks to 3 months. This precaution is based on the evaluation of a prescription drug, marketed for weightloss, that contains an ingredient Sodium usniate. Evaluations have shown that there are numerous cases of liver damage in people taking the drug. Because the Usnea plant easily absorbs heavy metals and sulfur dioxide (as mentioned in the description) it is important to only use products of the plant that have been harvested in an area far away from roads, factories, and polluted areas. 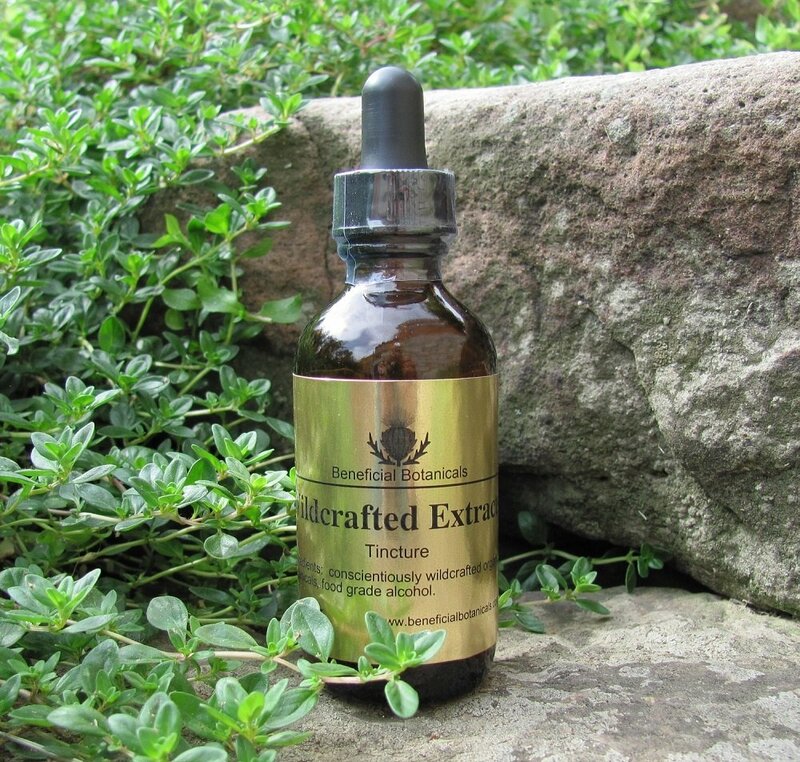 Beneficial Botanicals Usnea Tincture contains plants that have been harvested in a pristine area 5,000 feet above sea level. Stephen Harrod Buhner (2012). Herbal Antibiotics: Natural Alternatives for Treating Drug-Resistant Bacteria. pp. 196-206. Behera, Verma, Sonone, Makhija (January, 2006). "Determination of antioxidative potential of lichen Usnea ghattensis in vitro"
 Mark Blumenthal, ed. (1998). "Usnea". The Complete German Commission E Monographs. Austin, Texas: American Botanical Council. p. 224. [5} "Usnea: Using Usnic Acid as a Fish Remedy for Tumors and More”, Aquarium Pond Answers. Ash, Michael; Irene Ash (2004). "Lichen (Usnea barbata) extract". Handbook of Preservatives. Synapse Info Resources. p. 437.